This card is earned in the Blackrock Mountain Adventure. Defeat Emperor Thaurissan in the first wing, Blackrock Depths, to unlock two copies of the card. Once you have earned the regular version of Resurrect, you can craft the golden version for 800 Arcane Dust. Summon a random friendly minion that died this game. I walked into the dungeon and noticed a slain adventurer. In his final moments, he had scrawled out a message in the dust on the wall beside him. Two words: "rez plz"
It'd be nice if the same minion couldn't be revived multiple times as a new rule, since revive decks can get pretty cancerous when they get their combo. Turn 1: Nothing. You're a Priest, you don't have a turn 1 play. Turn 2: Lesser Heal your opponent's face. "The light shall burn you!" Turn 4: Resurrect into Resurrect. Your opponent starts convulsing. Turn 5: Onyx Bishop. Your opponent is now legally deceased. Sure, this is rather unlikely, but in the off-chance it happens, it's powerful as all hell. Actually, turn 1: Northshire Cleric. No because that would mess up the Ressurect of if it dies. Well would'nt it also be good to rez that? I think so. My favourite flavor text so far! Stable Portal. Period. Same rarity, same cost. 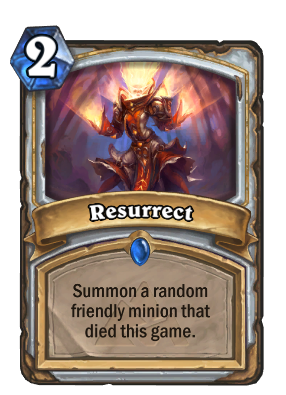 Now do cards resurrected add to the graveyard? I imagine the answer is yes. The trick of this card is to rig your deck so that you are always getting at least two mana worth of minions. Even getting the lowly loot hoarder back is not bad perse. And a Northshire Cleric is totally acceptable at two mana. You may want to reconsider playing Sludge Belcher over say a Sunwalker, just so you brick less with Slimes or sheep or Frogs. Against mages and Shamans you should try getting these cards out of your hand before any of those hit the bin. Already had a guy turn 3 blademaster into turn 4 double resurrect. And I thought to myself "Wtf, ressuREKT". I play Emperor Thausarrian, and my opponent kills it. Turn 7, I play Resurrect and I get Emperor back. My opponent then Hexes him. If I had cast a second Resurrect, could I have gotten Emperor again? Is he still in my invisible graveyard, or does Resurrect take it out? You have to love RNG. I was playing against a priest and, when he used this, he got a Northshire Cleric to go up against my 3/2 Acolyte of Pain. Next turn, he used his second one and got a Slime.